Introduction : Recent advances in the technologic and surgical instrument fields have resulted in the developments of robotic adrenal surgery. PRA has several superior benefits comparing to the others in terms of direct and short access to the target organ, no trespass and irritation of intraperitoneal space, no need of retracting adjacent organs, and safety and ease for learning this method. Recently, we have experienced several cases of robot-assisted PRA using single-port access for small adrenal tumor. In this study, detailed methods and preliminary results will be introduced. Patients and Method: From March. 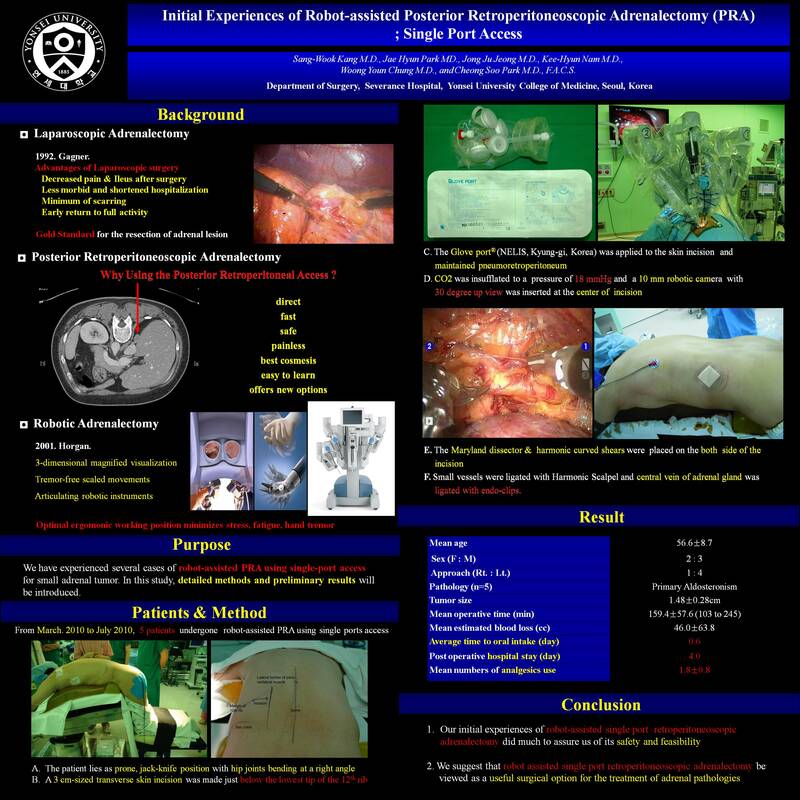 2010 to July 2010, 5 patients have undergone robot-assisted PRA using single ports access. The patient lies as prone, jack-knife position with hip joints bending at a right angle. A 3 cm-sized transverse skin incision was made just below the lowest tip of the 12th rib, and the Glove port® (NELIS, Kyung-gi, Korea) was applied to the skin incision and maintained pneumoretroperitoneum. Small vessels were ligated with Harmonic Scalpel and central vein of adrenal gland was ligated with endo-clips. The clinico-pathologic data of the patients were analyzed retrospectively. Results : The mean age of the patients was 56.6±8.7 and 2 women and 3 men were included. Right and left side approaches were performed in 1 and 4 patients, respectively. All the cases were primary aldosteronism. The mean size of tumor was 1.48±0.28cm. Mean operative time was 159.4±57.6 minutes (range 103 to 245) and mean estimated blood loss was 46.0±63.8. Average time to oral intake and postoperative hospital stay were 0.6 and 4.0 days, respectively. The mean numbers of analgesics use for pain control was 1.8±0.8. There was no conversion to open surgery and postoperative complications. Conclusion : Our initial experiences of robot-assisted single port retroperitoneoscopic adrenalectomy did much to assure us of its safety and feasibility. We suggest that robot assisted single port retroperitoneoscopic adrenalectomy can be viewed as a useful surgical option for the treatment of adrenal pathologies.